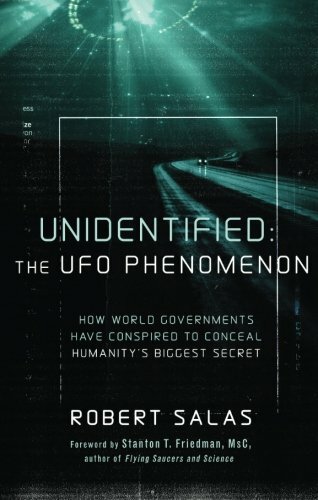 Obtenez le livre Unidentified: The UFO Phenomenon: How World Governments Have Conspired to Conceal Humanity's Biggest Secret par Robert Salas, Foreword by Stanton T. Friedman au format PDF ou EPUB. Vous pouvez lire des livres en ligne ou les enregistrer sur vos appareils. Tous les livres sont disponibles au téléchargement sans avoir à dépenser de l'argent. ..".fasten your seat belt. You are in for a fascinating ride." --Stanton T. Friedman, author of Flying Saucers and Science "Salas takes the reader on a compelling and heartfelt journey through the minefields and thickets of government secrecy and cover-ups as he experienced it from his own encounters with ET, while weaving into his page-turning narrative a concise history of the modern UFO phenomenon." --Thomas J. Carey, best-selling co-author of Witness to Roswell "Not only is Bob Salas an Air Force insider who had his ufological teeth cut by first-hand experiences, but he also possesses the scholarly background to analyze those events. With his tireless tenacity and no-nonsense mission towards disclosure, Bob is a genuine throwback to one of my own heroes, Edward Ruppelt." --Donald R. Schmitt, best-selling co-author of Inside the Real Area 51 In 1969 the U.S. Air Force issued a statement that read "No UFO reported, investigated and evaluated by the Air Force was ever an indication of threat to our national security." This statement is patently false. It has been proven untrue by the testimony of many military officers and airmen and documentation of incidents involving UFOs and nuclear weapons, testimonies of which the U.S. Air Force was fully aware. "Unidentified" details many of these testimonies, some for the first time. As partial justification for its position, the Air Force cites a University of Colorado study that was contracted and paid for by federal funds. "Unidentified" reveals how this study was actually just another part of the plan to cover up the reality of the UFO phenomenon. For the first time, "Unidentified" publishes evidence that the investigators for the Colorado study knew about the UFO-related missile shutdown incidents but did not investigate them or include them in their final report." "A sober yet heartfelt narrative which dares you to dismiss it without due consideration"
"Not only is Bob Salas an Air Force insider who had his ufological teeth cut by first-hand experiences, but he also possesses the scholarly background to analyze those events. With his tireless tenacity and no-nonsense mission towards disclosure, Bob is a genuine throwback to one of my own heroes, Edward Ruppelt." ..".fasten your seat belt. You are in for a fascinating ride." "Salas takes the reader on a compelling and heartfelt journey through the minefields and thickets of government secrecy and cover-ups as he experienced it from his own encounters with ET, while weaving into his page-turning narrative a concise history of the modern UFO phenomenon." Robert Salas is a graduate of the U.S. Air Force Academy, class of 1964. He served seven years on active duty before separating from the Air Force in 1971. While on active duty he worked as a Weapons Controller, flew target drones, commanded inter-continental ballistic missiles as a launch officer, and a worked as an Air Force missile propulsion engineer on the Titan III program. In 1969 he earned a Masters Degree in Aerospace Engineering from the Air Force Institute of Technology. From 1971-73 he worked as a safety and reliability engineer for Martin-Marietta Aerospace and Rockwell International on Space Shuttle design proposals. From 1974 until his retirement in 1995 he worked for the Federal Aviation Administration as an aircraft structures certification engineer. In 1998 he earned a Masters Degree in Education from the University of Washington. Since 1998 he has worked as a high school mathematics teacher. He currently teaches and tutors mathematics. In 2005 he published the book Faded Giant with co-author James Klotz which details his UFO incident while stationed at Malmstrom AFB, Montana in 1967. Mr. Salas has been publicly speaking about his incident at UFO conferences, radio and television since 1996. On September 27, 2010 he co-sponsored a press conference at the National Press Club in Washington DC where he and six other ex-military witnesses testified to the reality of the UFO incidents at U.S. nuclear weapons bases.